Hello, spotted this on instagram, looks handy. 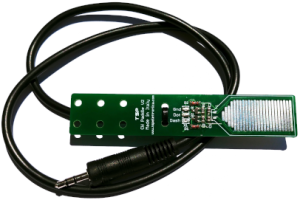 Morse Stick Keyer 2 - TSP S.r.l. Il Morse Stick Keyer 2 è il tasto per telegrafia più piccolo e leggero al mondo. Funziona con tutte le radio più moder, per esempio FT-817 e KX3. Looks like the M0UKD touch key circuit? The page you link to Tommy, doesn’t give a price though - since you accidentaly bought one, what did it cost? 16 Euro! Plus post cost 5 Euro. Already ordered. Hear it on the air soon. Well that makes it unsuitable for 99% of GM summits. I have a hard enough time with my straight key! There’s your problem. You need to get with the times, remove the hegemony of cisnormativity and get a non-binary, gender fluid key. It does look like a “touch sense” keyer. As stated above It will most likely be problematic in humid/damp environments. You folks should check out February 2019 QST. There is an article about a “Force touch sensor” cw paddles. I am in the process now of building one, with a lot smaller sensor for SOTA. So far on the “breadboard” results are VERY promising. Although I designed a different circuit using only a BS170 MosFet and one pull-up resistor with a 9v battery. It still even works down to 3v so it will work with a tiny single cell Li-ion/Li-po battery or tiny watch battery. I kind of like it better because it only draws about 250-300 uA key down. During idle time the quiescent current is so low my multimeter reads 00.0 so I will not use a power switch to turn it on/off. Have a look…it might work for you folks in the extreme damp climates. Being on a summit doing Morse Paul is twice as hard than doing it at home. Several high scoring SOTA Ops will only chase using CW from home, but won’t try calling CQ in CW on a summit, they stick with phone. Don’t give up, watch the spots, then listen at home. For the more experienced ops it’s becomes repetition, same-same every QSO. Observe to determine the pattern and when confident give it a go! Much easier chasing from home, not sure about you, but many activators either don’t have a station at home, or if they have they don’t use it for SOTA Chasing. Us regular chasers know most of the other regulars calls through familiarity, so often even if only a 2 letter partial is picked out of a 10 station pile up, such as KP, so you go back to PA0SKP IMI and 99% of the time you’ll be right. I think the cw exam was the most terrifying exam I ever did. Took me three goes to pass the 10 wpm test. I was on 15m with hundreds of JA stations in my Novice days before taking the next level test working lots of qso’s. But glad I stuck at it for sure, cw is a great mode once mastered. think the cw exam was the most terrifying exam I ever did. Took me three goes to pass the 10 wpm test. I was on 15m with hundreds of JA stations in my Novice days before taking the next level test working lots of qso’s. But glad I stuck at it for sure, cw is a great mode once mastered. I never got nerves doing exams, but when the Marine Surveyor at Liverpool Docks said to me after sending the number groups “Send me a series of ones” I knew I had faffed up by sending an extra dash on the end of a one. I carefully sent another five perfect ones and he passed me, what a relief! As the licencing authority at that time was moving location they took five months to issue my licence in May 1982. By that time I was up to 18 wpm and ready for a paddle key. No ham suspected I was a pirate using CW! But Paul, you did a proper test with the GPO examiners. They were hard but fair in ensuring they didn’t let loons, eejits and halfwits on the air. My tests were done by helpful amateurs and whilst the volunteer examiners did the job, the test was anything as scary as the GPO tests. You’ve proved you could do it… just have bash on the next activation (if you have the time) because you know that everyone will do their best to help you so they can get the chase. I am in agreement with Andy. I took my Morse test at a radio rally, it was on Valentine’s Day in 1999. I had been learning Morse with a friend from my local radio club; I would go to his house each week and we would take part in an on air net, using his Yaesu FT736R on 2m. My friend had already passed his test and I was encouraged to try a test at the next rally as a sort of dummy run to see what was involved. I paid my £20 and took the test. Unfortunately a car alarm started going off outside during my test and it didn’t help my receiving one bit! My examiners apologised for the external noise and pretty much forced me to do the test again. Unexpectedly I ended up emerging with a pass! I literally had a handful of CW QSOs until I got really interested in LA1KHA’s SOTA challenge around the middle of 2010. Egged on by Tom M1EYP, I did a CW activation of Great Whernside in August 2010, it was terrifying at the start, but I mangled through and by the end I’d made quite a number of QSOs and I was absolutely over the moon! I built my Rockmite based rig for the LA1KHA challenge and started using it at 11 wpm at the start of 2012. I didn’t break any records with the challenge but my SOTA Morse improved to a usable level quite quickly. I progressed to using KD1JV MTRs and the default speed is 20wpm - I usually go at that speed now because I’m too lazy to change the speed! This year my plan is to improve my ‘QSO’ Morse, my shack project is now gathering speed and I hope to be on air in a few weeks. Regarding touch keys, I’ve heard so many reports that they’re useless outside, I’ve never even tried one. I think a good old mechanical switch is the way to go. Your learning time to achieve 12wpm concours with my learning time to achieve 20wpm in the RN. Our basic training as ROs was about 26 weeks, and I’d estimate we did between 40 minutes to 1hr 20 minutes per day, 5 days a week. It takes time and effort to learn morse. I have a naval certificate/qualification to say I passed a morse sending test when I became a leading RO at 25wpm at 99% accuracy - using a straight key. Alas, with a gap of 47 years I can no longer manage to send more than 18wpm with my key. But I can still copy 30-35wpm and write most of it down - but you wouldn’t like to read the scribble! 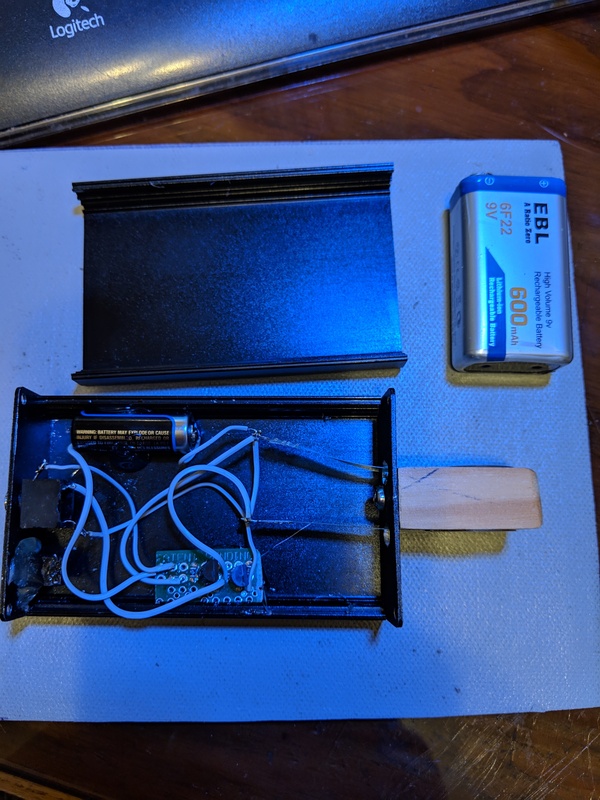 Some interesting stories coming out in this thread - which started with a photo of a dodgy piece of circuit board and a circuit turned into a Morse Key. To be honest I wouldn’t mind a bash with it to see how it performed! I hadn’t got the full history of Colin M1BUU and Morse - an interesting tale for sure. Andy is right in his comments to Paul - give it a try Paul on 20m or 30m or 60m I say on a summit on a nice day when it is comfortable to sit for a while - make a start, even watch Gerald performing - and if operators go too fast for you, try to ignore them and pick off the slower senders coming back at your own speed. 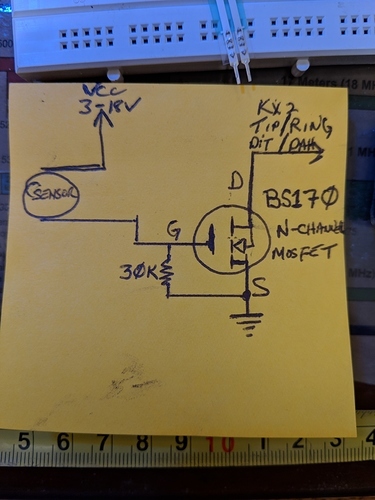 You should get no more than a small pile on those bands, especially if you run QRP. Push the power up to 50 watts from an FT-857 on 40m and you’ll get a shed load of callers instead - which you might find harder to cope with. For Dave - I have also had professional coaching in Morse of a similar type to what you describe and developed my skills accordingly, 100% accuracy being essential as you describe, or its a fail. This experience followed on from my self taught amateur radio Morse. There are several others operators doing SOTA who followed a similar path. I can’t talk about it on here unfortunately, as I signed the offical secrets act, but it kept the wolf from my door for 15 years and got me a good pension in the process! I never had to send Morse professionally - I gave up the hand key at 18 WPM in 1984 when I went twin paddle after two years ham radio experience. I’ve never stopped operating ham radio since 1982 apart from short periods when I have been off the air for house or job moves. The website claims it works without a battery. Interesting. All the sending in the videos is at quite slow speeds. Also interesting. 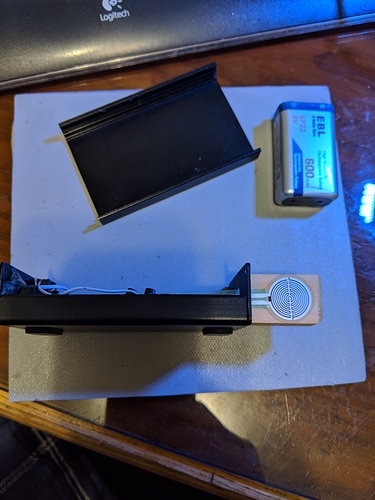 Well I built a facsimile of the “Force touch sensing” paddles that is in the Feb 2019 QST and so far it works great and no RFI problems so far here in the home shack like I did with the capacitive touch sensor I built previously. I built it for SOTA missions so that will be the true test to see if will be RFI sensitive. 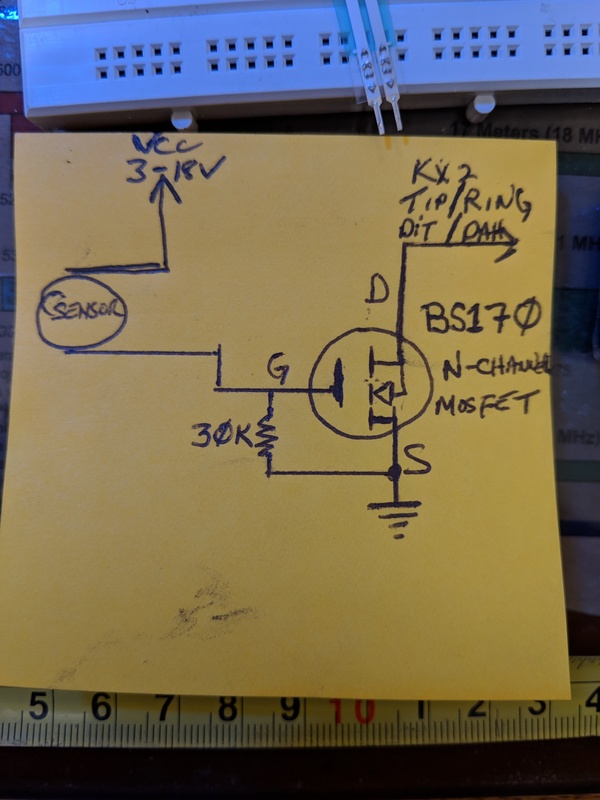 Instead of using the Op amp chip I just used a BS170 mosfet and a 30k pull-up resister for each dit/dah circuit. 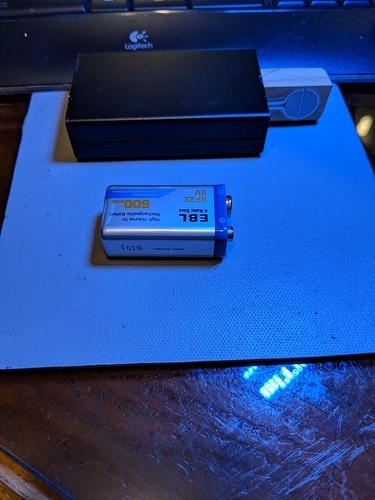 Quiescent current is so small the little 12V, 23A battery should last a very long time but just in case I ordered some 23a battery holders from China. I think this paddle should work in any climate but time will tell. Originally I planned to use a 9V battery but it was a bit big for my enclosure so I went with the much smaller 23A. Since it is 12v it made the paddles slightly more sensitve. Perfect for me. The 9v battery pictured is just for size comparison.